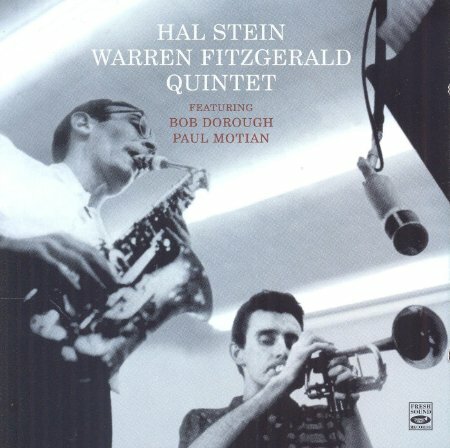 The album revealed Stein as a competent, vigorous soloist, a Bird-molded altoist and a hard-school tenor out of Byas-Hawkins’ school, and Fitzgerald as a percussive trumpeter with a sharp-toned, rough-edged conception, though not a markedly individual soloist. But the most impressive contributors to the session were also to become the most widely known. Pianist Bob Dorough,later also celebrated as a singer and composer, delivered fluent, inventive solos and offered fine support in a rhythm section notable for the presence of the soon-to-be great and influential drummer, Paul Motian, with Al Cotton on bass. "So much great music came out of the mid 50s that it’s forgivable to overlook various artists. Fresh Sound Records brings back into sharp focus two trumpet players that will make you wonder where they’ve been your whole life. The 1955 album co-lead by Warren Fitzgerald/tp and Hal Stein/as-ts along with Bob Dorough/p, Al Cotton/b and Paul Motian/dr (!) is a cult classic in Japan, and it’s easy to see why. This session is vintage West Coast cool, with sleek harmonies, lithe grooves and optimistically lyrical soloing. A gorgeous medly of “You Go To My Head” and “ Goodbye” show the two horns in lyrical form, while uptempo pieces such as “Bee Dee’s Blues” and “Zounds” cruise like a vintage Chevy Bel Air, fins included. This is as delightful as anything done at the same time by Shorty Rogers, so if you’re a fan of that, jump right in."